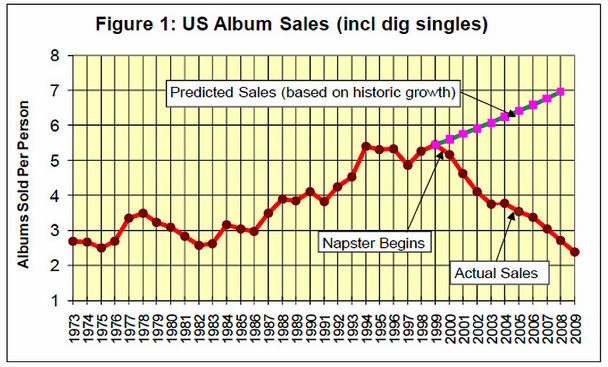 Isn’t it amazing that projected sales based on historic growth show none of the, er, historical plateauing you expect from any healthy graph and in fact see as having occurred here many times pre-Napsters and then NEVER AGAIN IF NAPSTER HADN’T HAPPENED. Guess what, MusicTown? Even if Generation Y hadn’t happened, and even if the youngest members of Generation X kept buying music instead of (okay) stealing it in college, the economic still would have gone in the crapper at least twice since then. You’re not really saying that incing Napster early would have stopped the dotcom bubble burst or the downturn after 9/11 or the mortgage crisis, are you? And remember how you abandoned all the Baby Boomers once you got your hands on their kids’ allowance? Remember how you stopped producing Adult Contemporary, remember how you colluded with radio stations and sales tracking companies? Remember how you gave us post-grunge? You’re saying that would not have happened? Are you saying MTV and Vh1 would have kept showing your ready-made commercials instead of banking easy cash from reality shows and nostalgia trips (which ironically tended to feature the very artists you’d stopped promoting)? For real? Music Industry, you can do so much better than this. Throw in some downward trends to make this graph realistic. I’m disappointed in you, frankly. Napster or no Napster, there’s no way I buy seven albums this year, friends. Radio is free, dynamic, and serendipitous. I do iTunes, but almost only when I have gift cards. Last album I bought? Neil Young Live at Massey Hall (digital download). Before that? No Line on the Horizon, physical copy. Both were excellent choices and lived up to the album mystique. But I knew that beforehand. Buying albums from new acts is, like, seriously committing. I don’t know. Though now that I think of it, I did buy a Taize album for someone for Christmas, and that was a good call. Sales graph shenanigans aside, what do you think? Are albums (even digital ones) obsolete? Has Steve Jobs (not Napster) really killed the music business like His Royal Joveness says? Previous Post Touché, Apple. Touché. And also William Faulkner, Barack Obama, 1995 etc. Well, 9/11 and dotcom bubble bursts might have caused a downturn, but issues within the music industry play a big role too. If U2 releases a new album, it could power the entire industry’s figures for the year. If Britney Spears, Eminem, etc, all disapear around the same time, that hurts a lot. When some marketer hatches Justin Bieber, wala, big jumps. You’re right on that this chart is a joke, but I think the ups and downs are likely caused by issues within the industry. I think that’s right, though I do also think that the general downturns would have meant we’d see some of those pre-1999ish dips happening again regardless of some of those industry dynamics. That said, I think the lack of bona fide superstars on the order of say, the Beatles or Elvis or Michael Jackson probably hurts the business, but even as I say that I recall that in the mid-to-late 90s, Garth Brooks broke just about every solo artist sales record there was. And then he retired. Like you said, when big names drop out for extended periods, there are corresponding downturns in the industry. It’s hard to track that against whatever next big thing sold a bunch records around that same time. I think it’s kind of funny (awesome) that the last year of the 90s was the last year of upward sales. I’m doing my bit to keep the music biz going. I buy, maybe, 10 to 12 albums a year, perhaps more. Nearly always lesser known artistes. I know taste in music is subjective but it does seem to me that with the growth of technology in the industry itself, and as a vehicle for accessing it quickly, the result has been a homogenisation of mainstream popular music. Or to put it more succinctly – there comes a point where even a Techno-Geekhead gets sick of being fed crap. Hence, fall in sales. I heard an industry spokesman on the radio recently commenting on the sudden UK rise to fame of Adele. His view ? That people have just got fed up with the wallpaper that is popular music and Adele (whether I/you like her or not) offers something a little different. Lets hope this record exec keeps looking more for variety. Ignore the figure (I’m up to 12 already). The thing I love about Adele is that to me she sounds like the greatest late 60s/early 70s artist that wasn’t. I think she’s great, and in the current climate, she certainly is different. On a smaller scale, it reminds of Norah Jones coming out 8 or 9 years ago and everyone saying how different she sounded. And she did…but she also sounded familiar if you go back far enough. I’m always interested in how new artists reinvigorate old forms…just look at Cee Lo Green, right? It speaks to the enduring quality of some of those older forms as much as to the amazing talent of new interpreter (and I’m a fan of Adele and Mr. Green). Great points, Mike!